Cooked Pro – Recipes, cooking & community. All the tools you need in a recipe plugin. Ingredients & directions, nutrition facts, photo galleries, interactive timers, printable recipes, and with the Pro version you add social sharing, submissions, user ratings, profiles, favorite lists and more. And with frequent updates, the features keep coming. Purchase the Basil Theme and your Pro license is free! Full support for Google Structured Data and schema.org. That way, your recipes look great in search results. Usually a pro feature, Cooked offers this for free. Quickly add ingredients and directions, drag and drop them, add section headings, direction images and throw in some interactive cooking timers. Your visitors can click or tap a timer link to start a countdown clock. You can pause and reset them individually, and multiple running timers are also supported. Display a formatted Nutrition Facts label that looks like the real thing! Also, when the serving size it changed by the visitor, the information updates automatically! For those that want or need printable recipes, Cooked makes it very easy. Your visitors can even pick and choose which parts they want to print. Full-screen mode is great for cooking in the kitchen! A quick glance at the screen will show ingredients, directions and any running cooking timers—all at the same time. The recipes are displayed in a beautiful card layout that adjusts itself automatically. You can then sort them by date or alphabetically, search by keyword and more. Each recipe can have one—complete with captions, a mobile-friendly slider, and you can even add a YouTube or Vimeo video to the beginning of the gallery slider. Use shortcodes to create your recipe layout. You can use it for all recipes or create a different template for each recipe. The choice is yours! 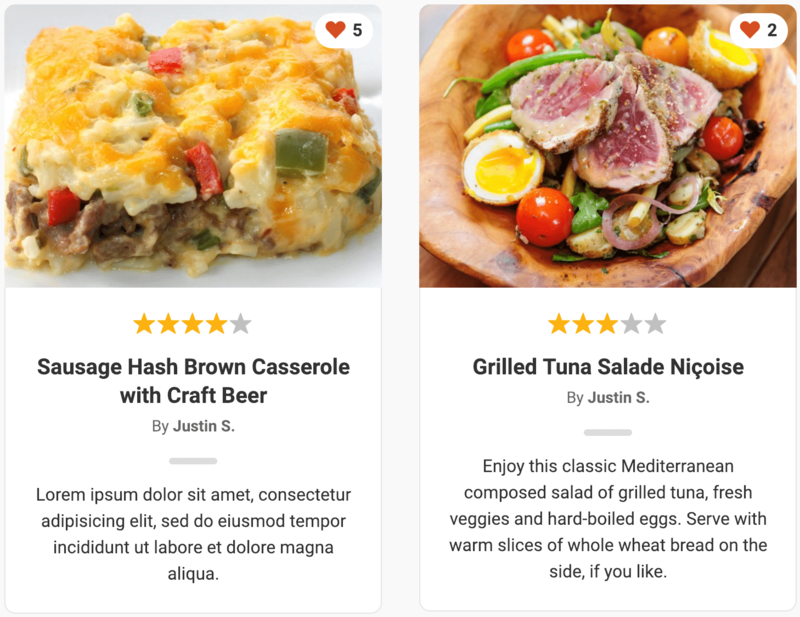 Users can rate each recipe with a star rating or thumbs up/down (you choose). Most noteworthy, if they happen to leave a comment on the recipe, their rating will show up with it. 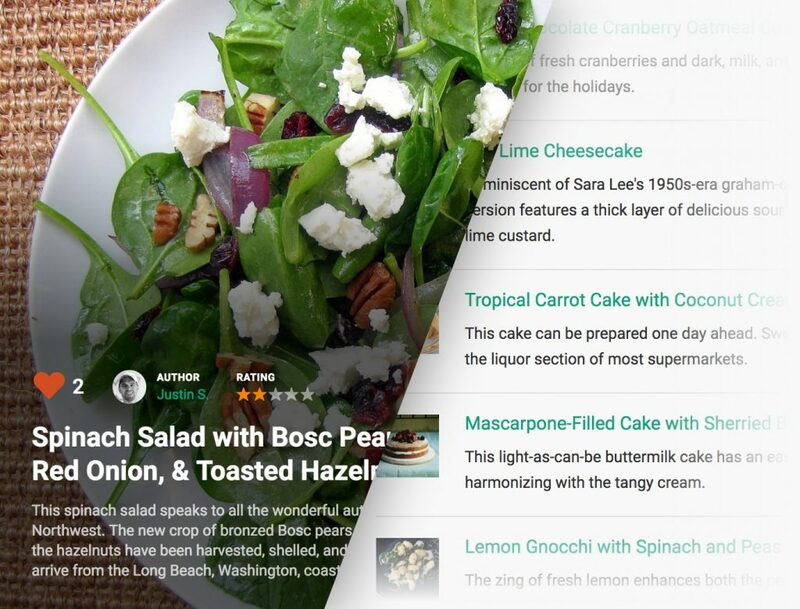 Your visitors can favorite recipes and then view them all from their profile. As a result, they can get access to their most loved recipes from a single source. Your visitors can easily share recipes to Facebook (with attached images), Twitter (supports tags), Pinterest (supports tags and rich pins), Google Plus and old-school style via Email. 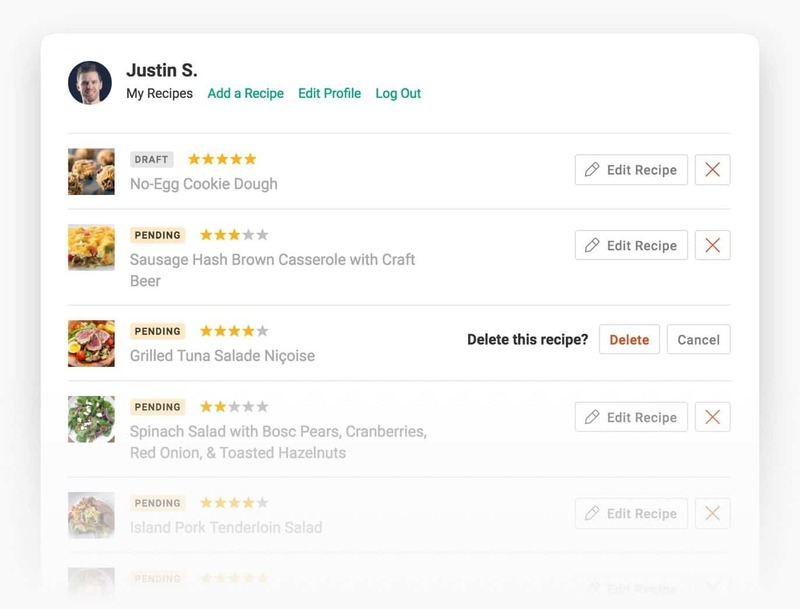 Each user can view their own recipes, favorites and update their profile information. Also, there’s a standard-issue registration and login form included, but you are not required to use them. Users can use a front-end submission form to submit their own recipes, either for their own use or for public consumption (after approval from the site administrator). Three additional taxonomies are included, allowing you to sort your recipes by Cuisine (French, American, etc. ), Cooking Method (baking, grilling, etc.) and even tags. And as a bonus, the tags are handled like #hashtags and will show up with Twitter and Pinterest shares! First, we have the Modern Grid layout. A cleaner take on the default style. All recipes are the same height and contain more concise information. In addition, you get the Full-Width layout. Beautiful image-centric recipe layout, complete with the title, excerpt and interactive featured overlaid on top. Finally, there’s the Compact layout, a great layout for keeping things simple. Looks similar to a blog-style layout. So, are you ready to try the best recipe plugin available for WordPress?